Welcome to the modern take on the CNN Fear and Greed Index. Using modern sentiment indicators and important core technical analysis you can easily understand and evaluate the state of fear and greed in the current US stock markets. What is the Fear and Greed Index? 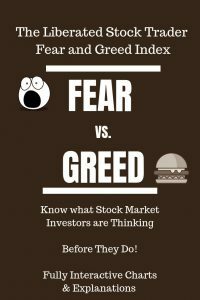 The fear and greed index has grown to become synonymous with trying to understand the state of mind of investors in the stock market. When people are feeling greedy it means they are either buying or will buy stocks, this pushes prices up, essentially increasing demand. When people are feeling fearful it means they are either selling or about to sell stocks, meaning there is an increase in the supply of stocks on the market which in turn decreases stock prices. How does the VIX Fear Gauge Work? A high VIX price above 20 indicates that more Put contacts are being purchased and that the investors are fearful and covering their trades with downside insurance. The New York Stock Exchange Advance Decline Ratio is the number of stocks with a price increase for the day divided by the number of stocks with a price decline for the day. Price is ultimately the decider of fear and greed and rising stock prices mean people are feeling bullish. How does the NYSE A/D Ratio work? A ratio of 1 means that there was one advancing stock for every 1 declining stock. Above 2 means that that the market is in greed mode with 2 stocks rising to every 1 falling. Here we take the S&P500 weekly chart and plot a 9-period moving average over it. The price line is the thicker blue line, the moving average is the thinner line. When the price is above the moving average indicator this is bullish, meaning the main price trend is up, therefore investors are greedy. How does the S&P500 Chart Work? When the price line is below the moving average this indicates fear. As we are using a weekly line chart we are estimating the long-term trend of the market, this helps you make better long-term investing decisions. How does the Financial Stress Index Work? When the value line is above zero or positive, this indicates that financial stress is above the historic average (fear). A value below zero indicates normal functioning of the markets (greed). A value above 0.8 typically indicates severe stress and fear in the markets, this occurred back in 1999 and 2007. In September 2008 the index spiked to a value of 6. Tip: Use the mouse scroll wheel to change interact with the chart time-frames scroll back to 1999 and 2007 to see the stress line rise. The American Association of Independent Investors (AAII) Investor Sentiment Survey measures the percentage of individual investors who are bullish, bearish, and neutral on the stock market for the next six months; individuals are polled from the ranks of the AAII membership on a weekly basis. On the chart the central horizontal line represents the average bullish sentiment over the period, 0.35 means 35% of investors possed were optimistic that the stock market would rise over the next six months. At the extremes, the AAII sentiment indicator registered 0.2 or 20% of investors were bullish at the worst point in the financial crisis in December 2007. The highest level of bullish sentiment was on December 20, 1999, when 75% of investors were bullish; this was during the Dotcom bubble hype a few months before the crash. How does AAII Sentiment work? This indicator is best used as a contrary indicator when sentiment is extremely high it is an indication to sell, and when extremely low and an indication to buy stocks. As Warren Buffet says “be fearful when others are greedy and greedy when others are fearful”. How do the Buy Sell Technical Indicators Work? When any of the above technical indicators is clearly a buy or a sell it counts as 1 point. When it is unclear is counts as neutral. Now take a look at the Buy Sell Indicators below to see the average rating and the buy-sell and neutral ratings. We have all heard the phrase “Boom and Bust”, but what is it? What causes it? More importantly what effect can it have on our investments? What is Boom and Bust? “Boom and Bust” describes the sequence where an economy, commodity or market sector goes from surging forward, making lots of profit and growing at breakneck rates and is generally along the way improving the wealth and standard of living of all participants in the market. A boom is usually accompanied by a significant amount of greed or irrationality about the underlying fundamentals of the Boom. “Bust” refers to the contraction of the previous boom, usually fueled by a significant economic or fundamental change in the criteria that fueled the boom in the first place. This tends to result in various side effects ranging from a reduction in profits, earnings, growth, increased unemployment, restriction of credit, and of course, a strong change of psychology of the market participants from optimism and greed to pessimism and fear. Why do “Booms and Busts” occur? Take for example the famous Dotcom boom of 2000. Greed surged into the marketplace on the misplaced belief that new Internet-based technology would fundamentally shift the market dynamics and business models of the future. Technology became fashionable and “Bricks and Mortar” businesses were perceived to be outdated and almost worthless. This paradigm shift meant that money poured into technology stocks at an unrepentant rate and that money poured out of “Bricks and Mortar” stocks at an equal rate. A telltale sign of problems to come was really noticeable when stock analysts would suggest Price Earnings valuations on tech. stocks of 200, 300 or more were reasonable even though the companies in question had never made a profit. The Price Earnings Ratio is the ratio of the Stock Price to its actual earnings. If a P/E Ratio is at 30 then it would take the company 30 years to earn back the share price. The higher the P/E ratio, the higher the expectation that the stock will perform well in the future. You can also see the Price Earnings (PE Ratio) as a valuation of the worth of the stock, if the P/E is 200 you are essentially paying 200 times the earnings capacity of the company. In the year 2000, the PE Ratio of the S&P500 reached nearly 45. This was an all-time high and essentially indicated that the expectation of the market participants was completely unrealistic. By the time the inevitable correction completed, the P/E Ratio for the S&P500 had halved to just over 20. Much of the greed and hype was fueled by professional analysts and so-called “market gurus.” They became greedy and euphoric: a heady mixture. When everyone slowly began to realize that the huge profit expectations would not be met by the tech. industry, the entire sector collapsed, bringing with it other industries, indices, and markets. The technology bubble had burst. If you found value in this modern analysis of the fear and greed index or want to help us improve, leave a message below or share with your friends. It should be immediately expanded and published /updated Daily/Weekly. Thank you, for this compelling sentiment illumination. Hi Joe, well I am very glad you like it. It is self updating using the tradingview technology. This is a really great set of charts, its now very clear, I will be using this in the future. Will checking it weekly be often enough? Hi Eddy, I do not have a 100 year chart here. But you can use your mouse to scroll in and out of the chart to zoom in. 26 Punkte Strong buy heisst verkaufen ,26 punkte strong sell heißt heißt kaufen? Hi Eddy, are you referring to the AAII indicator? If so, use it as a contrary indicator, when everyone is greedy be fearful. When everyone is fearful, be greedy. I see the 9 indicators. Where is the Fear-Greed index? I was looking for a single number that combines all the 9 indicators similar to what the CNN Fear Greed Index provides. Hi Murali, long time no speak. I want the investor to make up their own mind as to the overall direction. It is never as simple as a single number. I’m not sure this qualifies as an “Index” if it limited to a list of 9 indicators. The CNN also using distinct indicators which are then combined into an “index”. No one should make decisions based on a single index or calculation, of course. But an “index” does sum up all the “indicators”.